Flicking through some of last year’s photographs, I realised that Lewes Castle and the Barbican House Museum would be a good place to start looking at the history of craft, in particular, that of spinning of weaving. “The variety of materials used and the diversity of functions that they served, show the ingenuity of prehistoric society. 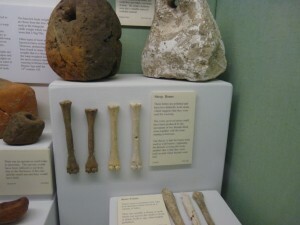 Anything from animal bones to pebbles were worked into useful tools and appliances. 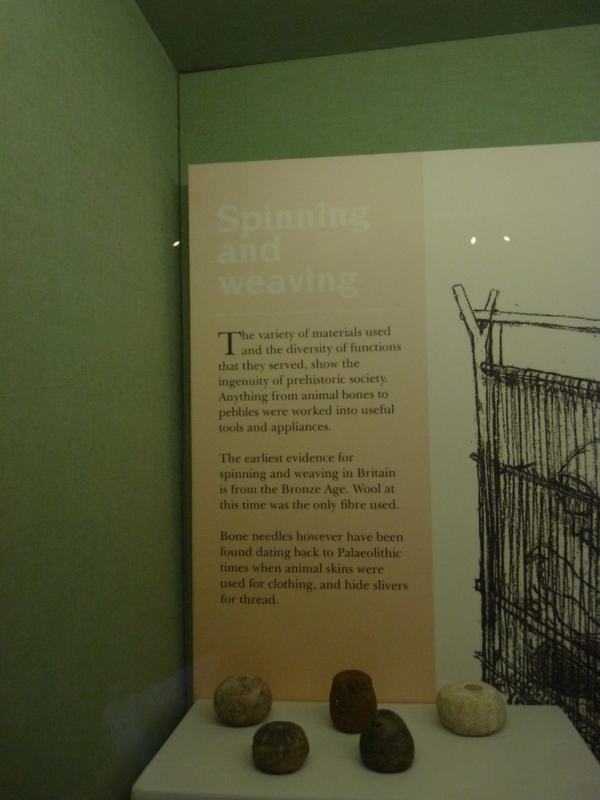 The earliest evidence for spinning and weaving in Britain is from the Bronze Age. Wool at this time was the only fibre used. 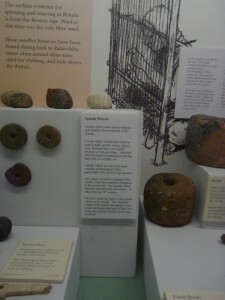 This section is about spindle whorls, which were used to balance and maintain the revolutions of the spindle, and were made from all sorts of materials. They are one of the most common archaeological finds, especially from the Iron Age onwards. The simple yet effective design has remained unchanged. 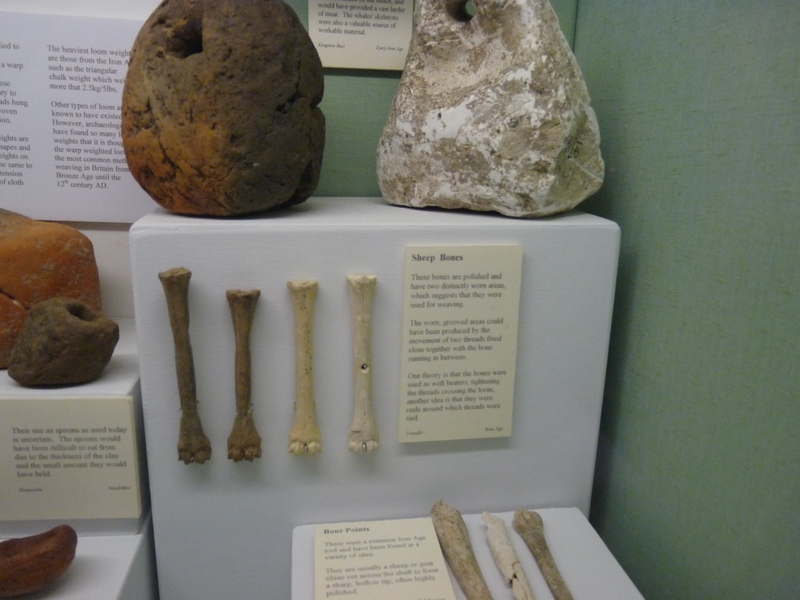 The sheep bones in the middle of the picture are thought to have been used for weaving, possibly as weft beaters, tightening the threads across the loom or possibly as reels around which the threads were tied. The illustration shows working on a loom with weights hanging on the warp (vertical) threads. Weighting the threads ensured that (a) they hung straight and (b) were woven under an even tension. While loom weights have been found in all shapes and sizes, all the weights on a single loom would necessarily have had to be identical. 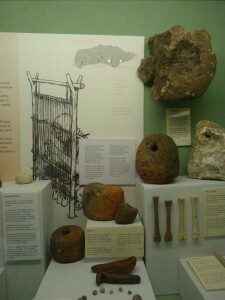 The heaviest loom weights were from the Iron Age. Although different types of looms existed, so many loom weights have been found that it is thought that the warp weighted loom was the most common method of weaving in Britain from the Bronze Age until the 12th century AD. 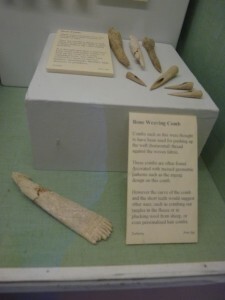 The bottom half of the picture shows a bone weaving comb. These were thought to have been used for pushing up the weft (horizontal) threads against the woven fabric, although the curve and the short teeth suggest other uses eg combing out tangles in the fleece. It’s fascinating to see how long these basic concepts of making cloth have been around.